New to Acajou ~ The art and science of Thai Herbal Compress Massage technique has been practiced for centuries in a culture known for its healing philosophy and techniques. 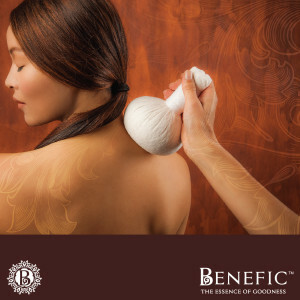 The synergistic blends usually contain between 10 and 30 traditional Thai herbs, bundled in pure cotton to form a herbal pressing sphere in accordance with ancient recipes. Each herb has its own unique characteristic and therapeutic property. Primary herbs such as phlai (cassumunar zingiber), ginger, lemongrass, galangal, eucalyptus and camphor act as decongestants and are often combined with antioxidants such as turmeric (curcuma longa), wild turmeric (curcuma aromatic) and tamarind. The combination of thermal, herbal, aromatic and massage therapies in one treatment at the onetime has a synergistic effect. The heated compress helps radiate heat through the body to dilate the blood vessels and increase the circulation of blood and oxygen around the body. As more oxygen is made available to various organs and tissues, they become more efficient, boosting the immune system and shifting energy. This is a wonderful treatment to reduce stress, to assist in reducing aching joints and muscles as the anti-inflammatory properties set to work. This entry was posted in News and tagged Benefic Thai Herbal Compress on February 17, 2015 by Rebecca Field.